The SIL-30ACMP achieves an ultrafast injection performance exceeding that of current models while maintaining ultralow carryover performance. In addition, up to 6 microtiter plates can be loaded, enabling a maximum of 2304 samples to be analyzed continuously. By incorporating these various functions, the Nexera MP which includes the SIL-30ACMP is ideally suited as a front-end LC for LC/MS and LC/MS/MS systems. The total-volume injection SIL-30AC autosampler features a pressure tolerance of 130 MPa as well as the world’s fastest sample injection (10 seconds), which dramatically reduces the total cycle time. It includes auto pretreatment and overlapping functions as standard, and an optional loop-injection method configuration to minimize delay volume. With reduction of the needle contact area, special coatings, surface treatments, and a new needle seal, the SIL-30AC reaches a new level of low carryover performance, which is especially beneficial for LCMSMS analysis. In addition, the included sample cooler features a dehumidifier function for storing samples at a constant temperature between 4 °C and 40 °C. The rackchanger unit replaces the microplates on autosampler racks to enable samples to be continuously analyzed. 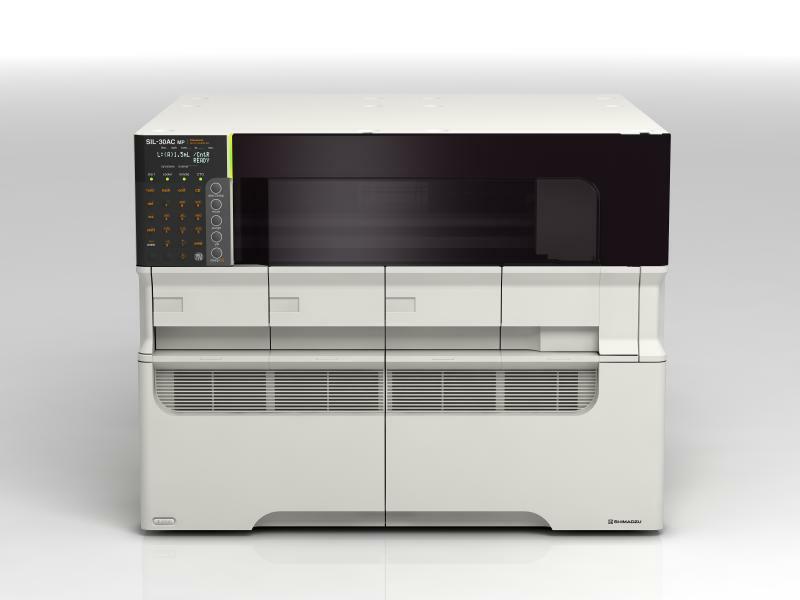 It allows loading up to 12 microplates inside the unit (maximum 4608 samples). Samples can be temperature-controlled with a block heating/cooling system (with dehumidifier function and 4 °C to 40 °C range) not only to refrigerated temperatures, but also to stable temperature levels near room temperature. The SIL-20AXR is a total volume injection type (direct injection) autosampler that, in addition to a high-speed injection function and high-precision function for injecting trace quantities, features an improved high-pressure valve that increases the pressure resistance (max. allowable pressure: 66 MPa). The internal volume of the high-pressure valve was reduced to suppress sample diffusion, which is especially suited to high separation analysis. The 20ACXR includes a sample cooler that allows samples in sample racks to be stored at a constant temperature between 4 °C and 40 °C. The SIL-20A is a total volume injection type (direct injection) autosampler that enables high-speed injection and multi-analyte processing. Materials used in needle, valve, and other flow lines were closely considered and a needle rinsing function is provided to carefully minimize cross-contamination (carryover), which is especially useful for high-precision LC-MSMS analysis. The SIL-20AC includes a sample cooler that features a dehumidifier function for storing samples at a constant temperature between 4 °C and 40 °C. The rackchanger unit exchanges the microplates on autosampler racks to enable samples to be continuously analyzed. 12 plates can be mounted inside the main unit and stored under refrigerated conditions. This is a multi-purpose model capable of large injection volumes. It is particularly well suited to automatic pretreatment applications, such as dilution and mixing processes using auto injectors. The SIL-10AF offers higher sample injection speeds than the previous SIL-10A model (reduced to 1/3 of previous) It can accommodate two 96-well microplates. The standard SIL-10AP can inject large volumes up to 5 mL. Use it for semi-preparative processing as well. * A CBM-20A or SCL-10AVP (version 5.40 or later) controller is required to use the SIL-10AF/10AP. CLASS-VP version 6.1 or later is required to control it via the workstation. An SIL-10A upgrade kit (228-40811-91) is required to upgrade model SIL-10A to SIL-10AF. To upgrade model SIL-10AP to SIL-10AF, an SIL-10A upgrade kit, together with 5-mL syringe with mounting bracket, 5-mL sample loop, fractioning stator, fractioning rotor, and an LL rack (compatible with 13-mL vials) are required. Comparison for Autosampler Selection Autosamplers can be selected according to objectives.